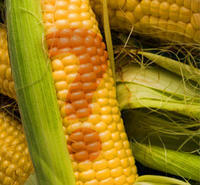 Most genetically modified (GM or genetically engineered) corn ends up as ingredients in processed food or as animal feed. Over 80% of the grain corn grown in Canada is GM. There is only a very small amount of GM sweet corn grown in Canada and the US. There is no GM popcorn on the market. Genetically modified corn is engineered to be toxic to particular insects. The GM technology transforms the corn plant into a pesticide. The toxin the soil bacteria Bacillus thuringiensis or Bt is expressed in every cell of the plant including the corn kernels. If certain insects, including the European corn borers, corn earworms, fall army worms and corn rootworm larvae, try to eat the corn, they will die. The Bt toxin attaches to receptors in the gut of some insects, rupturing the gut and killing the insect. Is your sweet corn genetically modified? The only way to find out is to ask. You have a powerful voice when you ask your local farmer or write to the head office of your grocery chain. Ask your farmer at the roadside, farm gate, or farmers’ market if they are selling GM sweet corn. You can even ask the Farmers’ Market to check for you. Write to the head office of your grocery store and ask them to remove GM sweet corn from their store. Tell them you don’t want to buy it. Click here to for grocery store contacts. Buy organic sweet corn – organic farming prohibits GM seeds and synthetic pesticides. Click here for a factsheet on GM corn to help you take action. Your consumer actions are making a difference! Update – September 26, 2017: Quebec group Vigilance OGM has tested sweet corn samples in Quebec and found no GM sweet corn. This is the third consecutive year that the group has tested and found no GM sweet corn. Significantly less genetically modified (GM) sweet corn was grown in Canada as of 2014, as many farmers and grocery stores started working to remove GM sweet corn in response to consumer concerns. CBAN tested samples of fresh sweet corn in 2014, and talked to seed dealers, farmers and grocery stores. We tested 137 samples of fresh sweet corn in 9 provinces in 2014 and only found one GM sweet corn (see more details below). The Canadian government (Statistics Canada) does not track how much GM sweet corn is grown in Canada. CBAN continues to work with you to ask farmers and grocery stores to remove GM sweet corn. Please continue to ask at the Farmers’ Market, roadside stands and grocery stores, and know that your actions are making a difference. There has been a small (undetermined) amount of GM sweet corn, from Syngenta, on the market for over 10 years in North America. However, in late 2011 Monsanto launched a line of GM sweet corn varieties as well. GM sweet corn is the only vegetable and whole GM food that is grown in Canada – as opposed to GM field corn, which is widely grown in Canada and used for processed into food ingredients, animal feed and biofuels. GM sweet corn is the third possible GM fruit or vegetable in the produce section of Canadian grocery stores. There could be some GM papaya (from the U.S. and China only) and some varieties of GM squash (from the U.S. only) that end up on grocery shelves in Canada. The sweet corn is genetically engineered to be both insect-resistant and herbicide-tolerant. Farmers may be planting GM sweet corn without knowing that it is genetically engineered because seed catalogues do not clearly label GM varieties. 2016: CBAN Member group Vigilance OGM tested 53 samples of fresh sweet corn in 22 different cities in 2016 Quebec and did not find any GM sweet corn. 2015: CBAN Member group Vigilance OGM tested 43 samples of fresh sweet corn in 15 different cities in Quebec in 2015 and did not find any GM sweet corn. Seed sellers are saying that they sell few or no GM sweet corn. 2014: CBAN tested 137 samples of fresh sweet corn in 9 provinces and only found one GM sweet corn (sold in a Metro grocery store in Quebec). 2013: CBAN tested sweet corn samples from across Canada and found unlabelled genetically genetically modified fresh sweet corn in grocery stores, roadside stands and farmers markets. CBAN testing clearly shows that consumers across Canada could be unknowingly buying GM sweet corn. Press Release – October 23, 2013: Tests Discover Unlabelled GM Sweet Corn in Canadian Grocery Stores and Farmers’ Markets. November 14, 2013: Following tests conducted in Canada by CBAN, Friends of the Earth US released the results of their tests on sweet corn samples. Tests of sweet corn purchased in the U.S. did not find any GM sweet corn except for two samples, one from Ontario and one of unknown origin. “We were alarmed to find a significant amount of GM sweet corn in Canada, and are shocked that Canada could actually be a source of genetically engineered sweet corn to U.S. consumers,” said Lucy Sharratt, Coordinator of CBAN. New study: GMO sweet corn rare in U.S. supermarkets. On July 15, 2009 Monsanto and Dow AgroSciences announced that they received approval to introduce their new eight-trait GM corn ‘SmartStax’ in Canada and the US. 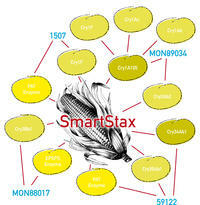 GM “SmartStax” corn produces six different insecticidal toxins and is tolerant to two herbicides. It was allowed onto the market in Canada without a safety evaluation from Health Canada. Health Canada does not classify “SmartStax” as a “Novel Food” because it has previously approved all of the eight GM traits individually, in earlier crops. Health Canada says that combining eight GM traits together does not create any new risks and does not need any safety evaluation. The Canadian Food Inspection Agency authorized the environmental release of ‘SmartStax’ but never conducted an environmental risk assessment and actually substantially weakened its environmental stewardship rules for the crop. Codex international food safety guidelines that Canada helped to negotiate clearly state that stacked traits can lead to unintended effects and should be subject to a full safety assessment. June 28, 2011 – Press Release: Report Exposes Unstudied Risks of Monsanto’s Genetically Modified “SmartStax” Corn: EU Member State critiques and leaked industry documents uncover safety questions. Press Release – July 29, 2009: No Safety Assessment of GE Corn by Health Canada: Canada Ignores International Food Safety Guidelines. Press Releas CFIA ’s Irresponsible Rubber-Stamping of New Genetically Engineered Corn No environmental risk assessment, and reduced environmental stewardship requirements for new Monsanto/Dow “SmartStax”. July 24, 2009. CBAN’s letter to Health Canada. July 28, 2009. Response to Health Canada: ‘SmartStax’ Genetic Corn Really Safe? Montreal Gazette, CBAN Opinion Letter, July 30, 2009. CBAN letter to the Canadian Food Inspection Agency, August 3, 2009. UN Codex Guideline for the Conduct of Food Safety Assessment of Foods Derived from Recombinant-DNA Plants. Health Canada initiate a full food safety assessment of the GM corn as set out by the Codex Alimentarius Guideline for the Conduct of Food Safety Assessment of Foods Derived from Recombinant-DNA Plants. Health Canada request the Canadian Food Inspection Agency halt any further approvals of stacked trait products until Health Canada has reviewed its Novel Foods Regulations and initiated a system-wide review of the entire regulatory system for GM foods and crops (“Novel Foods” and “Plants with Novel Traits”). Click here to read the full letter from CBAN to Health Canada. July 28, 2009. Read the Minister of Health’s response. Click here to read CBAN’s letter to the Canadian Food Inspection Agency, August 3, 2009. Read the CFIA’s response to CBAN. The UN Codex guidelines for GM food safety assessment state that “unintended effects in recombinant-DNA plants may also arise through the insertion of DNA sequences an/or may arise through subsequent conventional breeding of the recombinant-DNA plant.’’ (this is how stacked trait GE crops like ‘SmartStax’ are produced – through the conventional breeding or crossing of GM plants) and that such crops should go through a full safety assessment (para 14, CAC/GL 45-2003). The international Codex Alimentarius Guideline for the Conduct of Food Safety Assessment of Foods Derived from Recombinant-DNA Plants clearly recommends safety assessments of stacked trait GE crops. The Guideline clearly states that unintended effects can arise not only from genetically engineered (GE) plants, but can also arise when those GE plants are crossed via conventional breeding (as in the case of stacked-trait crops such as ‘SmartStax’): “Unintended effects in recombinant-DNA plants may also arise through the insertion of DNA sequences an/or may arise through subsequent conventional breeding of the recombinant-DNA plant” [boldadded] (para 14, CAC/GL 45-2003). Furthermore, the Guidelines also state that such crops should go through a full safety assessment: “The assessment for unintended effects takes into account the agronomic/phenotypic characteristics of the plant that are typically observed by breeders in selecting new varieties for commercialization. These observations by breeders provide a first screen for plants that exhibit unintended traits. New varieties that pass this screen are subjected to safety assessment as described in Sections 4 and 5” [bold added] (para 17, CAC/GL 45-2003). Canada has approved 2,4-D-tolerant GM corn and soy. On October 15, 2014, the US government also approved Dow’s 2,4-D/glyphosate herbicide mix, to go along with GM 2,4-D tolerant crops. Now Dow AgroSciences has all the approvals it needs to start marketing these GM herbicide tolerant crops in Canada and the US. Click here for some background information on 2,4-D and 2,4-D crops. “GM Sweet Corn in Canada: Information for Action” Details on GM sweet corn. Get your questions about GM sweet corn answered here. “Genetically Modified Sweet Corn” a printable sheet of info with some more basic info, for distributing in your community. 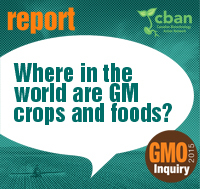 “Where in the world are GM crops and foods?” provides CBAN’s investigation into sweet corn and field corn numbers.